GoVenture MyFirst software programs are designed specifically for young children, ages 0 and up, who may not have mastered the use of the mouse or keyboard. All programs advance by the click of any button (mouse or keyboard), so young children are able to use the software with little or no assistance. 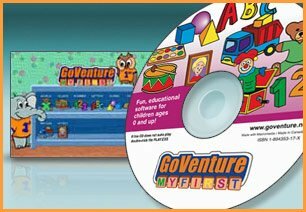 Designed as computerized versions of children's flipbooks, GoVenture MyFirst software programs allow the very young to "play computer" with you or on their own. The program loops for endless enjoyment - just hit any button to continue. You can even add your child's name or a personal message to display on screen. Parents rave about how much fun their children have and how quickly they learn with GoVenture! More than just an entertaining activity, GoVenture MyFirst programs are effective educational tools which help children develop important cognitive and motor skills. Play safe. Start the program and your child can play repeatedly until you halt it. Meanwhile, your desktop and other programs remain safe and out of easy reach, because GoVenture MyFirst programs play in full screen mode. Take advantage of the newly redesigned GoVenture MyFirst software programs. Originally produced in 1997 under the MyFirst Computer Book name, the software programs were so wildly popular, that within a few months, they found their way into tens of thousands of homes and schools in over 100 countries! And now we've created new editions under the GoVenture brand to take advantage of the latest computer advancements and help meet the overwhelming demand for high quality software for very young children.